100 Ratings for Suffusion – Hurray!!! Atahualpa – Really the inspiration behind Suffusion and in my opinion the gold-standard of theme customization, Atahualpa is way ahead on all statistical measures on WordPress: most downloads and most ratings. At the time of writing it has been rated a whopping 418 times on WordPress!! iNove – Another theme that has been around for quite a long time, iNove has been rated 193 times at the time of writing. Mystique – This is a really popular theme with WP users because of its catchy design. The only theme younger than Suffusion to have been rated more times than it, Mystique has 140 ratings at this point. Its current popularity will probably ensure that it will go over iNove in the near future. Thematic – It is no surprise that Thematic is the only free theme that has been in the top 15 popular themes since as long as I can remember, and that is very long! No other theme – Atahualpa, Mystique and iNove included has managed this distinction. Thematic is a very clean and well documented theme framework that most people swear by. If you are a theme developer, look at Thematic (and Hybrid) to see how to do it right. At present Thematic has been rated 111 times. Though unlikely it is possible that I have missed a few here. So if you are aware of any other themes that should be here by all means let me know. Thank you users, for using Suffusion and voting for it to let people know that you have liked it! My congrutaltion, this is a result of your hard work and your good work! 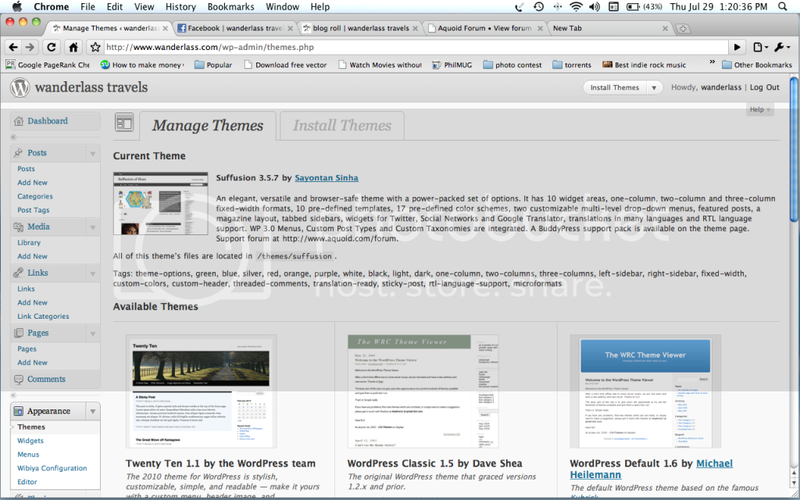 I just migrated to wordpress and just learning my way around… I’m going to install Suffusion soon as I figure them out! cheers and congratulations for a beautiful theme! You deserve this honor for the awesomely done work. Suffusion is the best theme I’ve ever seen. Your theme is amazing Sayontan !!! here my tribute to your theme. Congrats 🙂 by far my favorite wordpress theme, i use a lot of adsense across many of my sites and it’s easy to see that my best converting sites are using your style, so thanks for such a great release. I download suffusion theme from wp-themes and ftp to wp-content/themes/suffusion. i installed and activate it. i want to customize it but i don’t see the “theme option”. cannot figure out what went wrong. thank u. Under the Appearance, I don’t see the Theme Option to able customization. oh, i was reading old tutorial. i found new tutorial that it has own menu. forget above question.